My mission is to be a mentor to both men and women in the aviation community or who want to learn to fly for the first time. The ultimate goal is for my students to be exceptional pilots based on the principles of strong pilot knowledge, especially in the area of safety, and sound judgment which in turn encourages continuous improvement. Airplanes were designed for three-dimensional flight. Unlike an automobile, train or boat, an airplane can truly move in three-dimensional space, yet most pilots never learn to fully maneuver the aircraft in this 3-D environment. Student pilots learn to takeoff, climb, turn, descend and land, but that’s a very small part of the total flight repertoire of which many aircraft – and pilots – are capable. Pilots who have flown aerobatics develop an instinctive awareness of attitude and the fastest way back to straight-and-level controlled flight. They are able to quickly identify upsets and properly react to them, resisting the urge to pull back on the yoke when an upset occurs. They become familiar and comfortable with the mechanics of spin recovery. Aerobatic pilots develop an increased feel and sensitivity for the controls of their airplane, leading to improved handling of the aircraft both on and off the ground. The new aerobatic student quickly learns that AEROBATICS IS FUN! . . . perhaps more fun than working on any previous rating. The pilot who completes a 10 hour aerobatic course does so because he enjoys it. Learning loops, rolls and spins is exhilarating, and a beneficial side effect is the increased skill and confidence the student takes back to his regular flying experience. The pilot who regularly flies solo aerobatics experiences a unique sense of freedom and personal fulfillment as he fully controls the airplane through true 3-dimensional flight, using the entire flight envelope. Q: Is there a special Pilot’s License or “rating” needed to fly aerobatics? A: No. A Private Pilot certificate is all that is required to fly solo aerobatics. 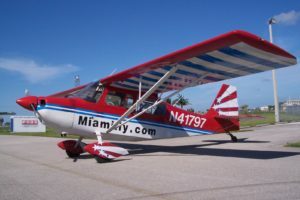 With the exception of airshow flying, the FAA does not regulate aerobatic competency; however, it is the pilot’s responsibility to get the dual instruction required to fly safely. There are no special requirements to be an aerobatic student pilot other than good health. A: No more so than other types of general aviation activities. 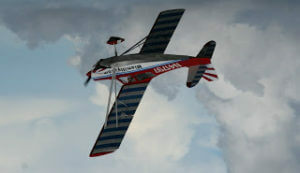 Aerobatics is not “stunt flying”. Safety is the prime objective in aerobatic instruction. The International Aerobatic Club (IAC), who sanctions aerobatic competitions, has maintained a perfect safety record for more than 25 years. Q: Will we wear parachutes? A: Yes, it’s a requirement by the FAA (FAR 91.307). We have both chair-pack style and seat-pack style available to assure the best cockpit fit. Q: Will I get airsick? A: Probably not. Most people find that if they’re busy flying the airplane, they won’t get queasy. Whether you’re flying a structured lesson or just a ride, we encourage you to do as much of the flying as possible. Ask anyone with a pilot license and they’ll give you a host of reasons. It may be a family who enjoys weekend trips and to save time, would rather hop on a plane and fly from New Jersey to Cape Cod in less than an hour instead of sitting in highway traffic. Or it may be the busy professional who understands the importance for meeting a client at the drop of a hat. Or flying may be a long-time goal to accomplish a new skill that requires a multitude of skills. Perhaps you were not athletically inclined. It is often said that learning to fly is easier than learning to drive. That goal evolves into a hobby or career — whatever you choose. The best part about flying–Leave anytime and get to your destination at the predicted time! Driving time can be cut in half. Where do you live? What cities within a 100, 200 mile radius would you like to visit that doesn’t have a major airport? With a private pilot’s license you can fly into smaller airports and it will cost you less! If you’re a business owner, did you know that flying time and expenses are tax-deductible? Everyone has or anyone can obtain a driver’s license. Take a class, practice with your parent and instructor for a few hours, take a quick written test and a five- minute driving test and you are instantly granted a driver’s license. Earning your pilot’s wings is different. You become part of an exclusive group and with reason. You’ve successfully endured intense training and passed all the rigorous testing. You emerge one of a few who have the right, the privilege to command a flying machine. You are no longer forced to confront the wrath of mother nature and can adjust your routes and navigation around the expected. Not so with an automobile. A pilot’s certification on your resume speaks volumes. It shows you achieved a high level of responsibility, situational awareness and quick thinking skills. Making quick decisions in extreme situations is second nature to you. You have the complete confidence because you have achieved your pilot’s license.